On Sept 11th we said goodbye to over 20 great young students from the Caucasus who participated in our 2013 Birds and Biodiversity Camp. The camp was developed together with regional and European partners with support of the Youth in Action program of the EU Commission and aimed to bring together people from different cultural backgrounds at the Batumi migration bottleneck in order to learn about nature conservation. After 15 days living and working together in the BRC hometown of Sakhalvasho this group had become very close and it was a sad goodbye for everyone. However, we look forward to the contributions these guys will be making to conservation in Batumi and elsewhere after this inspiring camp clearly got this group hungry for more! 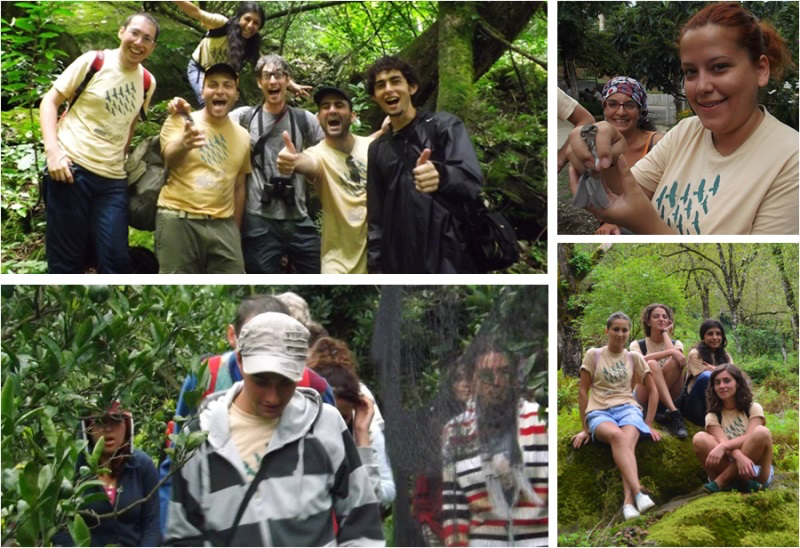 The camp started with a thorough exploration of the bird migration and biodiversity of the Batumi region. We visited important natural areas such as the Chorokhi river delta south of Batumi, Mtirala National Park and of course the BRC migration watch-points. We also maintained regular presentations and group discussions in order to philosophize about the diversity of environmental problems and about the potential of community-based nature conservation for alleviating some of such environmental issues. The work of BRC to minimize shooting of birds of prey in Georgia was used as a case-study of a science-based and integrative conservation approach working for the benefit of both the environment and people. Throughout the camp there was a big emphasis on team building across national borders. We were lucky to have a very diverse group of people who quickly opened up to each other, quickly becoming friends as the camp progressed. For several participants this camp has been their first chance to travel abroad, or to meet with people from neighbouring or far-away countries. All had a good knowledge of tradition and history in their own countries and we spent many wonderful nights chanting traditional folk songs and sharing traditional toasts among us … A great atmosphere in which a strong team spirit could develop. The open attitude of the participants was particularly helpful in the second stage of the camp when everyone worked in smaller teams to put their gained knowledge in to practice during the so-called mini-projects. The diverse backgrounds of the participants meant we got a very diverse range of projects across four teams. 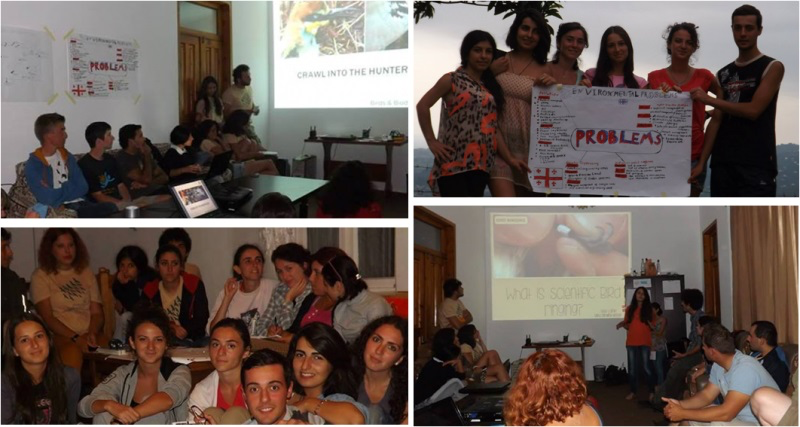 One team constructed an interesting questionnaire to study hunting culture in the Batumi area and conducted at least 50 interviews of which 30 with active hunters. A second group conducted a social study into the knowledge about birds and bird watching among Georgian people through interviews and an online questionnaire. They then continued to develop a range of interesting ideas and plans to popularize bird watching and to increase regional awareness about birds, especially among their peers. A third group consisted of people with a background in journalism and design who produced some great movies and articles about bird migration and the BRC project . With some follow-up collaboration now after the camp we will be able to share these materials also with you and our Georgian audience. Finally, one team developed a plan for constructing a long-term bird ringing survey in Georgia and designed a draft for a brochure with which to increase awareness about bird ringing among regional people, and especially hunters. Each group finally presented their achievements for a large audience of their fellow camp participants and international volunteers working at BRC. Each group managed to frame the relevance of their work in a broader context of nature conservation and it was great to see the dedication and enthusiasm of everyone come together in some great presentations. The projects were also well received by our international volunteers and festival visitors. We are particularly happy that several motivated Georgian participants are likely to continue working with regional youth together with the BRC. Several participants from neighboring countries were also inspired to take a new step in their education or careers back home, or to develop new collaborative youth exchanges with BRC in future years. In conclusion we look back to an awesome camp with great gratitude for the high motivation and interest of all the participants. The BRC is more motivated than ever in its engagement to inspire and support the new generation of conservationists in Georgia and wider Caucasus region. The Birds and Biodiversity Camp was organized in collaboration with young and dedicated nature enthusiasts from JNM (Belgium), Young Biologists Association (Armenia), AYDC (Nagorno Karabakh), and Kuzeydoga (Turkey) and with logistic support of the Acopian Center for the Environment of the American University of Armenia. Sponsors of the Birds and Biodiversity Camp 2013 include the EU Youth in Action Programme and the Rufford Small Grants Foundation. Opticron Ltd. kindly provides optic materials for our young participants.